France, 2009, 150 minutes, Colour. Francois Cluzet, Emmanuelle Devos, Gerard Depardieu, Vincent Rottiers, Soko, Brice Fournier. What are con men like and how do they operate? Screen con men can be outgoing and charming, like Tony Curtis in The Imposter or Leonardo di Caprio in Catch Me if You Can. 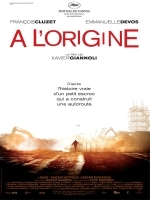 However, Francois Cluzet in A L'Origine is not a man of immediate charm, though he will have his moments. Released from jail, Paul (Cluzet) gets some help from a criminal friend (Gerard Depardieu) and then robs him of fake documents and order forms as well as cash. He then proceeds to a profitable scam. As he gets bolder, he finds himself involved in a fraud that not even he can manage, creating a new identity as Philip Miller, the building of part of a highway in northwestern France – well, the point of the story (based on actual characers and events) is that for most of the time he does manage, providing work for a town which has been on the downturn for two years since the project was shelved because of environmental reasons. Cluzet is a fine actor and carries off this seemingly impossible charade with great skill, discovering a kinder side of himself as well, discovering love and, as he says of those who get out of jail, that they sometimes want to take on the world, conquering his. Emmanuelle Devos is the sympathetic mayor of the town. Singer Soko is the motel maid who has more capacities than she recognises and Vincent Rottiers is a young dealer and petty criminal who is the first to see through the con man but comes good in a way that shows he is not without hope. At over two and a half hours, it is a long film for such a story. However, it is told in an engaging and interesting way – an odd variation on the triumph of the human spirit. 1.A true story? Credible? Conmen, fraudsters? 2.A French conman, his style, operating in north-west France, in the town, the difficulties? The motels, the fair, life in the town? 3.The highway site, elaborate, lights, machinery, the hard work? In the rain? 4.The introduction to Paul, with the police, moving him on, just out of prison? Abel and his help, the fake documents, offering him jobs? Paul stealing from him, going on the road? 5.The initial frauds, the documents, the phone calls, his pretence, buying the equipment, selling it? 6.Paul as a character, his past, relationship with his wife? Son? Watching him at the match? Seeing her at the toll booth, the meeting with her, her partner, the documents for his acknowledging the man as father of the child? His not signing them? Later changing his mind? 7.His getting the letterheads, redesigning his truck and the logo? The fake documents? Going to the town, their situation, the abandoned highway, the environmental problems with the beetles? No work for two years? His room at the motel, discussions with Monica, her giving the information? His devising a plan? The motel owner, organising the deal with the owners of the machinery-lending company? The discount, paying cash? His leaving? His decision to return? 8.Paul’s comment that a prisoner wants to take on the world? His leaving a hundred euros for Monica? Listening in to the meeting, the discussions with the mayor, her comments on his poor speech and not giving detailed information to the council? His anger, reaction, return? 9.Setting up the plan, everybody in the town helping? His motivation? The town’s motivations? The downturn, unemployment? The issues of documents, ninety days before paying, the delayed chequebook? The bills? Hiring people? The bank manager and Paul persuading him? 10.The fair, Paul changing his name to Philip Miller, his forging signatures? Monica and Nicholas and Esteban at the fair? His helping them? The photo with the mayor and the celebrities? Abel discovering his whereabouts from the photo and the television coverage? 11.On the site, the machinery arriving, circling him for a salute? Employing Louis as the foreman? The others? The quality of the work, the determination, the rain and making provision? 12.Philip Miller and his signature, his identity, discussions with the mayor, the relationship, her story, the widow, her affected by him, his loving her and the change in him? 13.His growing more desperate, the need for money, putting off decisions, avoiding appointments and phone calls? 14.The talk with Nicholas, the initial robbery in the car by Nicholas, Nicholas as a drug dealer, his love for Monica, the child not his own but loving the child? His anger at the basketball game? Arrest, the stealing of the scooter? Police suspicions? Philip getting him the job? His training? Becoming serious, his knowing the truth about Philip, influencing him about principles? 15.Monica, her work, efficient, her suspicions? Her love for Nicholas, infatuation with Philip, love for her child, their wanting her to become pregnant again? 16.Abel arriving, his threats, his hold over Philip, the demand of the money, Philip ringing, the meeting, with the gun, shooting at the railway lines? Abel meeting Nick, wanting the drugs? 17.The raid on the offices, the mess, Philip wanting no charges? Buying new equipment with his own cash? 18.The temptation to leave, to return? Using up his fraud money? Paying the men? His decision to go to the head office, his explanation, the officials dumbfounded? 19.His determination to complete the work, by the date, despite the rain? Nicholas and his being in the vehicle, the accident, the explosion? Philip rescuing him? The truth, the mayor’s reaction, the people’s reaction? The end, his decision to finish the road? Waving the flag? The final information about the quality of the work that he supervised? 20.The focus on a man who was a criminal, yet had goodness in him, responded well to people, to challenges? The mystery of human nature and choices? The information about the man having disappeared in real life?